Every time someone starts to think of a pizza to eat then different pizza shops come in mind always which you have tried in different times. This is because it seems difficult to prepare it at home. Today, you try our quick and easy veg-chicken pizza recipe and I bet you will forget these pizza shops forever. 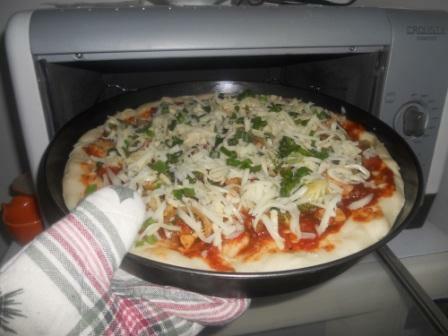 Making Pizza at home is always a challenge for most of the persons. But if you follow the instruction step by step then you can make it perfectly. Proof the yeast: Place the warm water in a bowl, sprinkle the yeast over the warm water and let it sit for 5 minutes. The yeast should begin to foam or bloom, indicating that the yeast is still active and alive. In a large bowl, combine the flour and salt. Make a well in the middle and add the oil and bloomed yeast mixture. Using a spoon, mix until a shaggy dough begins to form. When the dough has pulled together, turn it out onto a lightly floured surface, and knead until smooth and bouncy, about 8 minutes. If it’s too wet, sprinkle in a little more flour. Spread a thin layer of oil over the inside of a large bowl. Place the pizza dough in the bowl. A quick fermentation (1 1/2 hours in a warm place) will allow the dough to rise sufficiently to work with. Cover the dough with plastic wrap. For a quick rise, place the dough in a warm place (75°F to 85°F) for 1 1/2 hours until doubled in volume. Punch down the dough and turn it out onto a lightly floured work surface. Knead for another minute or so. Lightly flour the dough, then cover with a kitchen towel and let rest for another 30 minutes to an hour while you prepare the sauce and any other ingredients. Preheat the oven as high as your oven will allow, between 450-500˚F (230-260˚C) for at least 30 minutes, preferably an hour. Heat oil in a small saucepan over medium heat. Saute onion until tender. Season with sugar, salt, black pepper, broccoli. Add soy sauce and hot sauce. Simmer 15 to 20 minutes. Once the dough has rested, take a portion and start by poking the surface with your fingertips, until bubbles form and do not deflate. Then, stretch and press the dough into a thin round. Make it thinner than you think it should be, as it will slightly shrink and puff up during baking. Pinch the edges if you want to form a lip. When ready, spread sauce over pizza. Top with cheese and toppings. Slide the pizza onto the preheated pizza stone or pan. Bake for 15 minutes, or until the crust and cheese are golden brown. Add any garnish of your preference. For cheese lover, If you want, toward the end of the cooking time you can sprinkle on a little more cheese. Do add some oil on top of the pizza pan before putting your pizza in the oven. This is to prevent the pizza from sticking! Take a large bowl, combine the flour and salt. Add the oil and bloomed yeast mixture. Saute onion, sugar, salt, black pepper, broccoli. Add soy sauce and hot sauce. Simmer 15 to 20 minutes. Pinch the edges if you want to form a lip. Top with Chicken and veg and cheese.